Caring Homes, the national care home provider, believes in creating a positive, holistic environment for elderly residents, including those suffering from dementia. 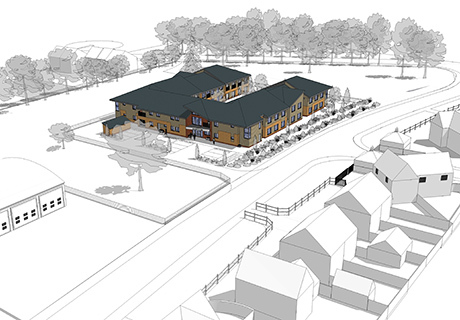 This approach is exemplified in the new 70-bed care home Barefoot & Gilles has designed for them in Norwich. Dementia can be described as a disability, and good design can enable sufferers of dementia just as it can help other disabled people. 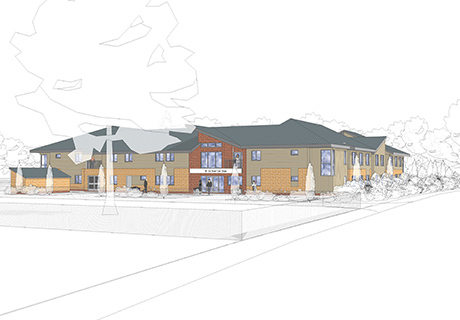 Caring Homes are working with the University of Sterling on an accreditation process for Dementia specific design, and with Dr Garuth Chalfont of the University of Sheffield on integrating a therapeutic landscape into the design of dementia care facilities. Wide circulation areas with natural light, links to therapeutic landscape environments and clear destinations encourage positive walking experiences for all residents. Small, friendly dining areas and living rooms make the home a place to live and invite visitors. Throughout the building, best practice for disabled living is incorporated, including in the private rooms with en-suite bathrooms. The building is designed to meet not only the perceptions of the end-user and the needs of the regulatory framework; it also meets strict cost guidelines to deliver a building which complements Caring Homes’ excellent bespoke service model.